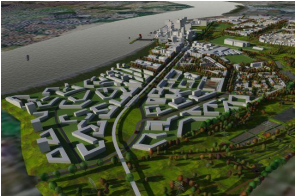 Barking Riverside is one of the largest development sites in London occupying 185 hectares in total and is the largest housing development in the Thames Gateway. The vision is for Barking Riverside to provide a model for sustainable living in the 21st century. Over the next 20 years it is planned to build 10,800 new homes to house 26,000 people. The development will benefit from new transport links including the East London Transit and the Docklands Light Railway. New primary and secondary schools will also be constructed. The specific development site described in this case study is the former Renwick Road Landfill (referred to as Area 9 by Barking Riverside). In addition remediation works were carried out on a contamination hot-spot in Area 7 to the west of Area 9. The Renwick Road Landfill [Area 9] occupies an approximate area of 2.1km² . The site is bounded to the north by Choats Road which divides the portion of the landfill currently undergoing development from another slightly smaller portion of the landfill to the north. The eastern boundary is formed by a leachate ditch and the south flowing Gores Brook. The southern boundary is delineated by flood defences and the River Thames. A large area of stockpiled surcharge material is located to the west of Area 9. This material will be utilised for surcharging Area 9. The landfill is understood to have operated as a local authority waste disposal site accepting domestic waste, asbestos waste, inert wastes, gasworks waste and contaminated soils between the 1950’s and 1993. The landfilled wastes were a highly variable mix of domestic and commercial wastes including soils with strong hydrocarbon odours. An area of shallow suspected gas works wastes in the south-eastern corner of site recorded particularly high cyanide concentrations. The base of the landfill was identified to be between 10m and 14mbgl – no membrane or engineered clay liner was identified suggesting the wastes lie directly on the natural alluvium. The contamination ‘hot-spot’ in Area 7 (to the west of Area 9) was identified as gasworks waste and specifically spent oxide waste. This material is assumed to have been tipped historically and is currently present within a hollow surrounded by surcharged material on Area 7 as a whole.